INTENSE WHITENING ACTION A whitening complex combining Glutathione, Vitamin C and Plant Extracts that whitens intensively. Glutathione and Vitamin C are anti-oxidants which prevent skin damage due to environmental stress. Together they improve skin tone and texture to reduce fine lines and wrinkles. ADVANCED SKIN NOURISHMENT Vitamin C, E, Shea Butter deeply moisturize to help reduce the signs of premature aging like skin dullness, dryness and age spots. Light, non-greasy formula quickly absorbs into the skin and leaves no sticky residue. EFFECTIVE SUN PROTECTION Protects the skin 25x longer from harmful UV rays that cause skin aging and sunburn. Full Size: 125ml/300ml Price: PHP 164.75 / PHP 329.75 DIRECTIONS: Apply gently to the whole body For best results, complete your skin care regimen with Gluta-C Intense Whitening Face & Body Soap and Body Lotion with SPF 25. Available in: Leading health & beauty stores, department stores, supermarkets and drug stores nationwide. 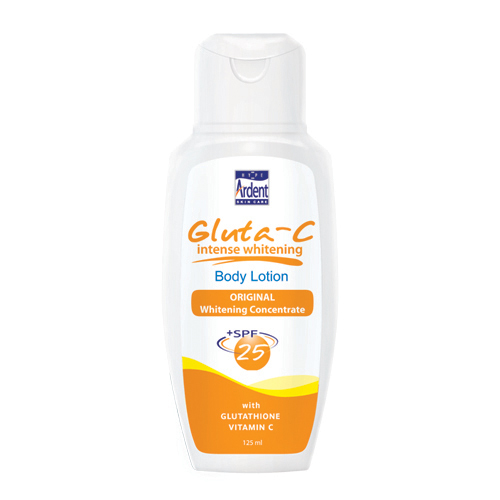 Social Media: Facebook: http://www.facebook.com/GlutaCIntenseWhite Twitter: @GlutaC Grab a sample at Sample Room!